Lee Michael Norris (born September 25, 1981 in Greenville, North Carolina) is an American actor, best known for his roles as Stuart Minkus on Boy Meets World and its spin-off Girl Meets World, as well as Marvin "Mouth" McFadden on One Tree Hill. Norris appeared as a recurring guest in the first two seasons of the Boy Meets World spin-off series Girl Meets World, reprising his role as Minkus, in which he is now the father of a teenage son Farkle Minkus (Corey Fogelmanis). 1993 The Young Indiana Jones Chronicles Kid #1 Episode: "Transylvania, January 1918"
2017 The Walking Dead Todd Episodes: "The Damned", "Monsters"
^ Terrace, Vincent (2017). Encyclopedia of Television Shows: A Comprehensive Supplement, 2011–2016. McFarland. p. 552. Retrieved 15 March 2018. ^ McRady, Rachel (14 November 2017). "'One Tree Hill' Stars James Lafferty, Lee Norris and More Support Co-Stars After Allegations Against Show's EP". ET. Retrieved 15 March 2018. 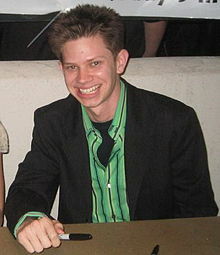 Wikimedia Commons has media related to Lee Norris.